Accu-Fab Welcomes Guy Somers (February 2014) | Accu-Fab, Inc. Guy Somers joined Accu-Fab as Engineering Manager in April of 2013. Relocating from upstate New York, Guy contributes over 20 years of management experience and 10 years of metal fabrication experience. He has a Bachelors Degree in Business Administration from the University of Buffalo and an Associates Degree in Industrial Technology. Guy lives in Creedmoor with his wife Lori and their 2 children. In his spare time he enjoys golf, auto racing, and vacationing at the coast with his family. Since joining the Accu-Fab team, Guy’s leadership skills and out-of-the box approach has made a tremendous impact on the engineering department. 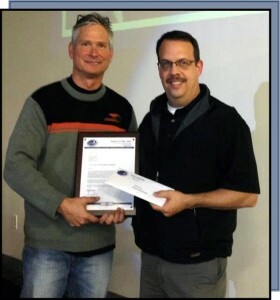 It was with great honor, that Gregg Page, President of Accu-Fab, presented Guy with the 2013 Special Recognition Award. Throughout his first year at Accu-Fab, Guy displayed strong team-building skills, a qualitative expertise in new product design, and helped improve various processes within the engineering department. We look forward to another great year of continuous improvement with Guy Somers on the Accu-Fab team.